The 6th CicLAvia is from 10 a.m. to 3 p.m. this Sunday, April 21, so time to oil your bike chains, lace up your walking/running shoes or break out the rollerblades! The route this time around is 15 miles and is strikingly different from earlier CicLAvias — this time it will be possible to travel back and forth between Venice and downtown Los Angeles, largely on Venice Boulevard. 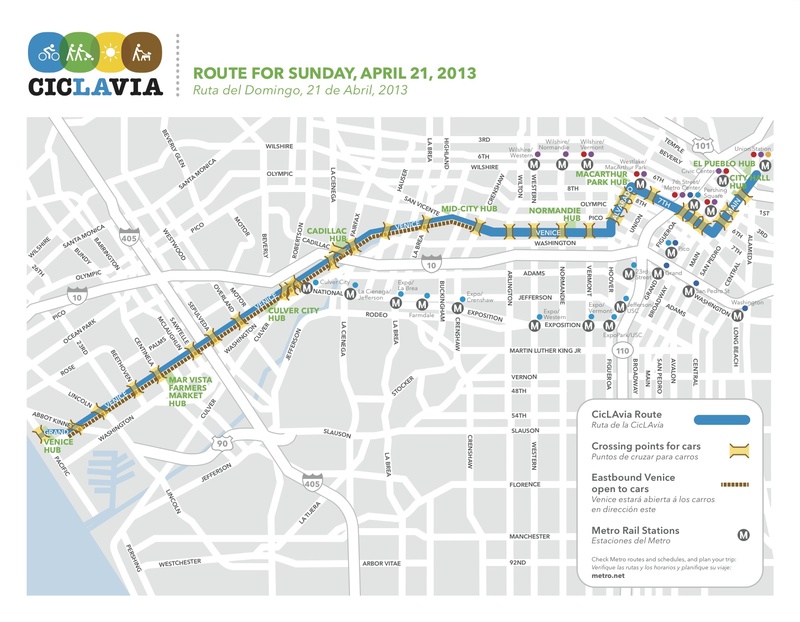 Longest route ever: Because this is the longest CicLAvia route so far, we encourage participants to approach the event with careful planning. Keep track of the time, noting that streets will begin re-opening to automobile traffic at 3:00 p.m.. You may not want to find yourself too far from where you started when the event ends. Getting to CicLAvia on Metro: It is also worth noting that the Festival of Books is happening at USC this weekend so if you plan to take the Metro Expo Line, leave yourself plenty of time as trains will likely have large crowds (Expo trains will be operating every six minutes). The Long Beach Grand Prix is also happening this weekend, meaning the Blue Line will likely be even busier than usual. With CicLAvia running through downtown Los Angeles, the course is accessible from the Metro Red/Purple Lines (Union Station, Civic Center, Pershing Square or 7th/Metro Center stations), the Metro Gold Line (Union Station or Little Tokyo stations), the Blue Line (Pico or 7th/Metro Center stations) or Expo Line (Pico or 7th/Metro Center stations). The Expo Line also has a station along Venice Boulevard in Culver City — as mentioned above, the Expo Line will be very busy this weekend. Bikes are permitted at all times on Metro Rail and all Metro buses have bike racks that hold two bikes; here’s a guide to taking bikes on Metro. Please do not block doors and try to use designated spaces for bikes on rail cars. If you want to avoid crowds, I recommend getting to CicLAvia a little early and leaving a little later — there are plenty of places to grab a bite to eat in downtown. If you need a place to hang out and kill some time, I highly recommend Grand Park in the Civic Center area; there’s plenty of grass and shade to go around, as well as a Starbucks and public restrooms. There is literally a Metro Red/Purple Line station in the middle of the park on Hill Street. If you’re driving to Metro Rail, here’s a guide to parking at different stations. One other potential wrinkle: The Kings have a home game at Staples Center at 6 p.m. Sunday against Dallas, so expect crowds in the Staples Center area. Share the road: A major difference with the new route is that cars will be permitted on the south side of Venice Boulevard between Crenshaw and Abbot Kinney. CicLAvia participants going in both directions will use the north side of the street, and will be protected from car traffic by the median strip running down the middle of Venice Boulevard. There will be plenty of traffic officers on hand to help manage the flow. For the latest info on Metro bus detours, visit metro.net.